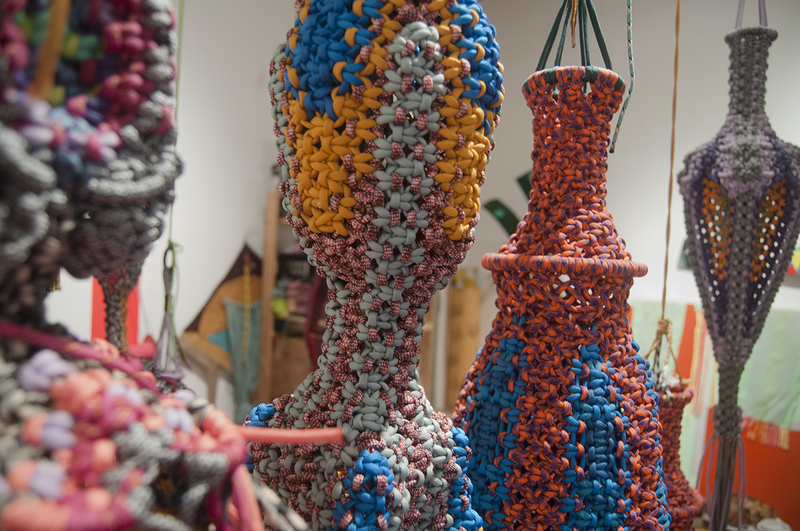 Hung like a mass of piñatas, Noël’s macrame sculptures drift throughout her studio in different states of completion. Previously titled “Eidolons” because of their specter-like presence, she is now moving away from the term to encourage a wider discourse for her objects, a way to embrace their increasingly architectural feel. I\W: Will you talk to me about your obsession/connection/relationship with eBay? NM: Yes. Absolutely. It is my favorite thing. Last winter I was in a slump and didn’t want to go outside, so I started to look for materials on eBay. I was coming across so many odd things that were cheap and accessible and curious. My mom was laughing at me over the holidays because I kept having to take breaks to get eBay time in. More recently I have been trying to use it as a matchmaker for various materials like fishing lures, dog tags, rope, or anodized aluminum. I am using it as a tool to connect ideas. Do you use the fact that each material was previously owned as a part of your practice? I would say there are hints of that occasionally. Sometimes I feel like the beauty of eBay is that you are able to give the object its next life, and I just need to embrace each object with my own means because if I hold on to too much of its past, it won’t make sense with what I’m doing. 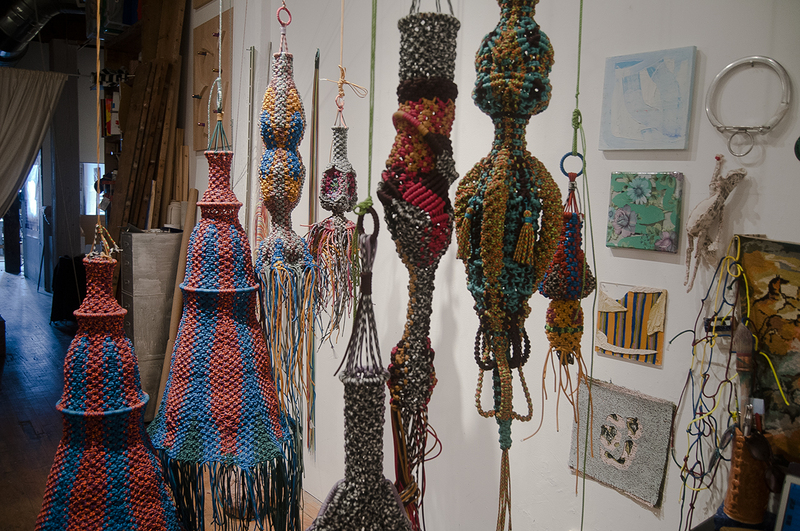 With my show at Faber & Faber I pushed myself to not macrame everything because that has been my thing recently. I use eBay like Google, to see reference images. I’ve been trying to create a metaphor between the paracord and macrame. Is there a direct reference, or are you just drawn to the rope’s colors? 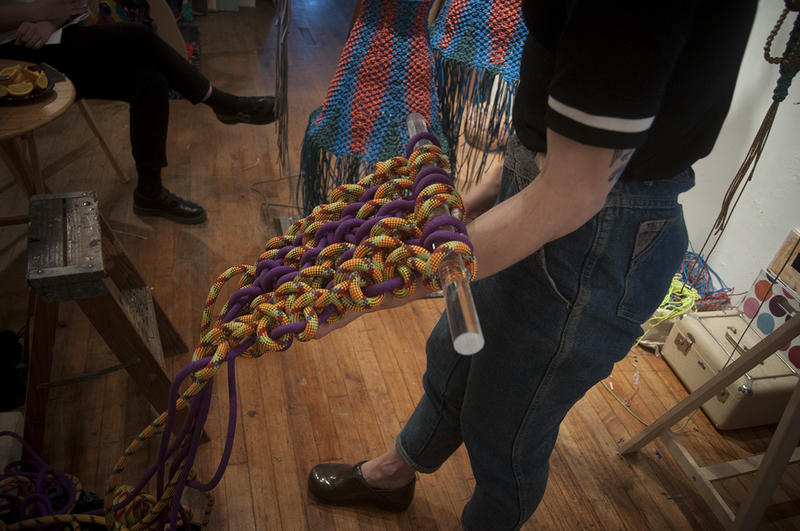 I have thought about this question myself because it is a tactile linear material and it is used for suspension and I am making this hanging work—I guess there is that parallel. I was initially attracted to the colors and then the patterns that I was encountering when I first started researching paracord. It was phenomenal and I just gave it a go. I am finding more and more that I am a super color-based person. 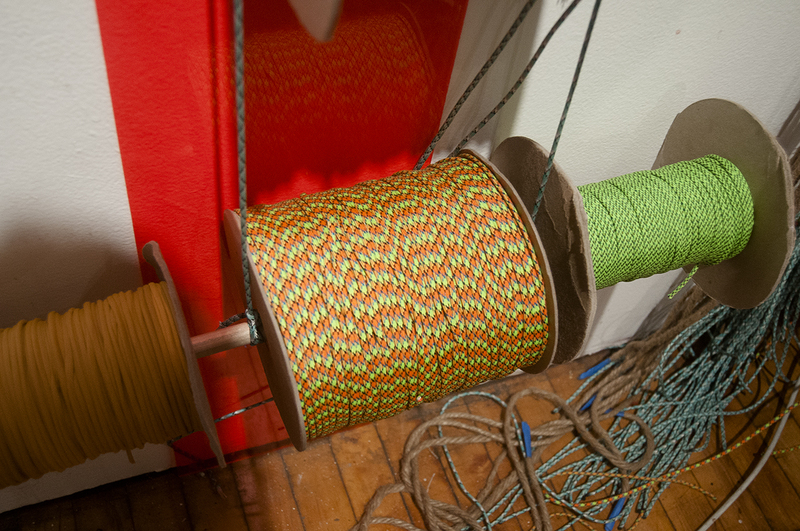 It is all about manipulating a color into an experience, so paracord right now seems to be this really ideal fit. 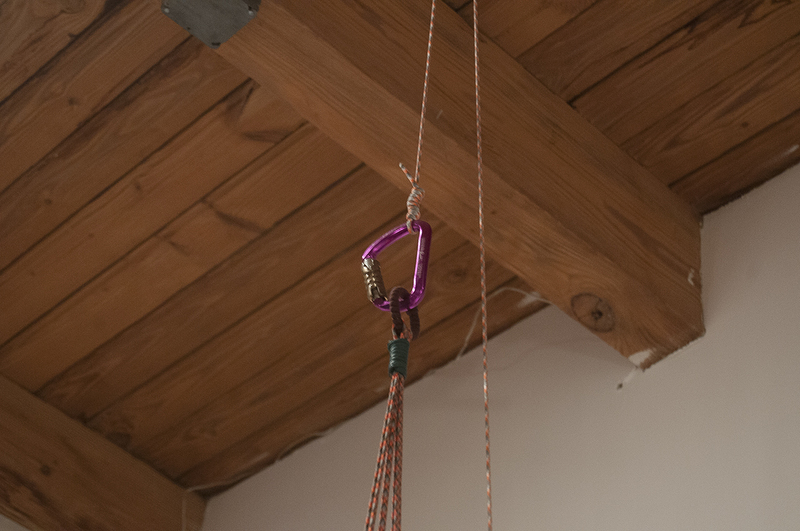 I have been trying to work with larger climbing rope, but it is stupid expensive and it just doesn’t have the same rhythm. I am also a stickler for crispness and clean, finished edges. The macrame speaks so directly to the ’70s, but the paracord gives it an incredibly ’90s feel and makes it almost futuristic. There is so much about the aesthetics of the ’70s that I will not deny that I draw from—I think it is super interesting. I feel sometimes when I am making these and how others react that they might be something from the now, but I also can’t help to think that they are dealing with a reversed sequence in time. I enjoy thinking of them as futuristic objects or place setters. 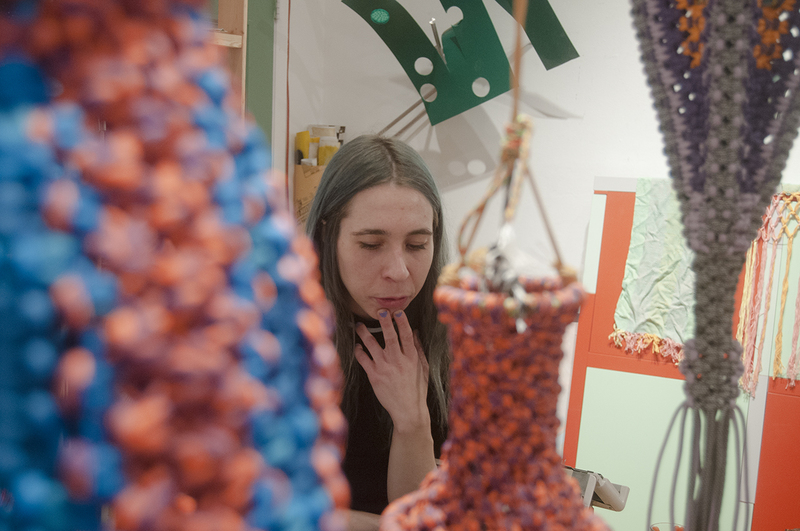 I feel like I have more of a background in installation, and there is something about that sharing and giving of an experience that I can’t let go of. These came from a mentality of not being able to make super huge things all of the time because I just didn’t have anywhere to put them. You also double back to your reference of paracord by using a carabiner to hold up one of your macrame pieces. Is this something you want to incorporate more in the future? I was trying to hone in more on this tactile cord thing and I was trying to figure out how to hang things and wanted to do a knot, but it wasn’t clean enough. I thought the carabiner was a nice pop of color and gave me another excuse to eBay. It’s something that I feel like within this work I don’t want to give up. 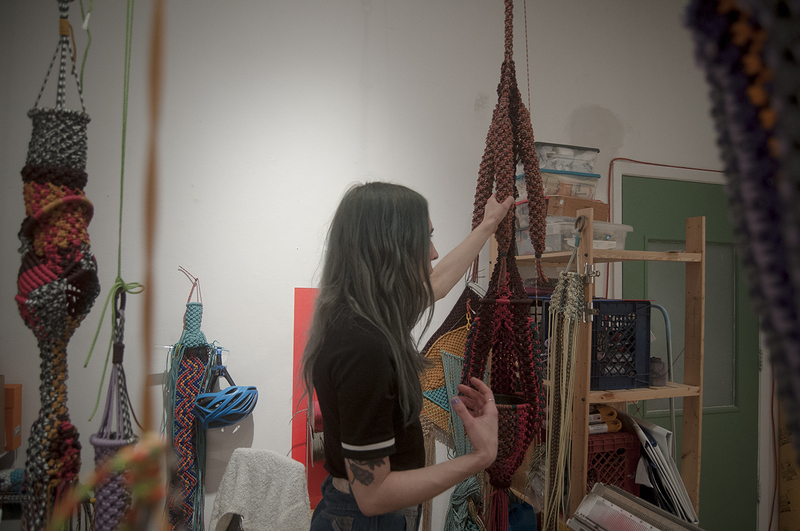 I have a show with some of my bigger macrame pieces at Slow in March with Max Garett that I will want to incorporate them into as well. When I would come in and out of my old studio, which was creepy and in an alley with only lights from afar, the light switches were like 500 feet away from the door. The macrame pieces would always scare me, because I knew what they were, but they would take on a different presence in the darkness and I would run around them. I love being scared and am a horror movie buff so I was trying to think of terms without saying specter or ghost that related to this. I found the word in an email my grandma had sent me touching on the Greek mythology about Orpheus and Eurydice. I thought it was an interesting word that pulled in Sci-Fi and the supernatural and paranormal. Some of the newer ones feel like they have more of an architectural element, and I feel like they are still ghostly in a sense, but I am trying to be open about other ways to talk about them and describe them. What are the tube-like elements of your macrame structures related to? I sold the first structure with tentacles as I like to call them, and have been trying to drag that element back into the newer stuff. I think they are really funny. A friend of mine mentioned that I used to make work all about penises and a piece I have now up at Faber & Faber is all open and vaginal. He said he wholeheartedly supported my transition. I didn’t know my work was taking on a gender change. I feel more recently I am trying to challenge what the knots can do, but it still comes back to referencing genitalia and I just have to take it and go…really phallic. How do you personally materialize color in your works? As I am getting older and as my practice gets more active and takes on these newer characteristics—color and repetition seem to be consistent themes. I feel like the actual knotting doesn’t take that long, it is more trial and error to situate the colors and patterns. I start out with a set plan, because I have to order cord online. By the time the cord makes it to me, the plan changes—I’m in a different mindset, the colors may be slightly different, etc. I made two pieces in tandem and when I was nearly finished, I had to reorder two shades of blue. The shades I needed were discontinued, so I had to unknot the entire thing to include the new shades of blue. I will also be the first one to admit that I am a glutton for punishment, and this is tedious and requires an exercise in patience—that is good for me. At the same time I sound completely Catholic. So much of my former practice involved paint swatches because it was free and it was an unbeatable spectrum and paper quality. I feel like between eBay and what people have generously given me as gifts, that I am constantly searching for what can be utilized next. My eBay wish list right now is filled with all sorts of anodized aluminum and I am trying to piece those things together to see how they can be manipulated into something more interesting than what they are.